An email from Alliance for Change (AFC) frontliner and Natural Resources Minister, Raphael Trotman, has confirmed Charrandass Persaud’s claim that the AFC has become a YES-man party, to the A Partnership for National Unity’s leadership in the coalition. The email, written prior to Local Government Elections, was sent to AFC members. It describes Trotman’s disgruntlement with the nature of the party’s relationship with APNU. Because of this disgruntlement, Trotman wrote about his suggestion that the AFC should take control of the coalition because, as he put it, “our coalition partner is in a weakened state”. He wrote that the coalition, in its endeavors, has failed “to operate as a single cohesive unit”. He further wrote that though the coalition is diverse, it has not wielded that diversity well. “Attempting to govern in an orthodox manner has hindered [the government] from making bold and transformative steps,” and that nothing about the 2015 campaign was meant to function in an orthodox manner. He urged the AFC members to switch gears and take advantage of 2019 because he believed that time is on their side, since 2020 is the year when petroleum production is slated to begin. This information sheds new light on the relationship between the APNU and AFC, who have been publicly decrying any claim that the coalition is insecure. 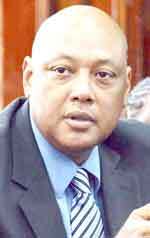 It was Charrandass Persaud who brought that relationship under the public spectacle when he voted in support of the motion of no-confidence against the government, then told members of the media, after the vote, that the AFC had become YES-men to the APNU.